Meet the collection of software downloads! The SoftEmpire directory maintains a set of tools, free programs, presentation, and trial versions computer program solutions to locate in different classes. The Softempire catalog is certainly free of charge to obtain. Move for excellent software utility systems and spend sparingly your time! Browse the free solution ultimate software program catalogue: system tools and applications, file protection programs, games, and many different great applications. Have a look on the great software collection on Softempire.com: there thousands of amazing and handy programs waiting for you. Utility software downloads freeware, shareware, and demo Download now! System software contriveed to help analyse, configure, perfect, and maintain the computer. Top Disk utility software downloads for Windows 7. Windows utility software tool accumulation to determine, coordinate, and optimize the working of the computer. 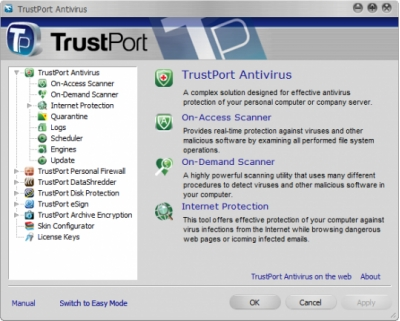 TrustPort PC Security 2010 is a comprehensive solution for the safety of your computer. It protects against various types of malicious codes, it eliminates spam, and it enables confidential and credible exchange of data.